Diah Manning was born in 1760 and served in the Revolutionary War as a Drum Major. He and his brother Roger were the handpicked bodyguards of George Washington at Valley Forge in 1778. Roger was in Colonel Israel Putnam’s regiment and Diah was in Colonel Jedediah Huntington’s regiment. Reputedly, Diah was said to have brought Major John Andre his last meal on the morning of October 2, 1780, the day he was executed as a spy. After the war, Diah served for many years as the bell-ringer for Norwichtown and sexton for the First Congregational Church. Diah Manning was kind to Jean Pierre Boyer, later President of the Republic of Haiti, who was captured by the Americans and stayed with the Manning family in 1800-1801. 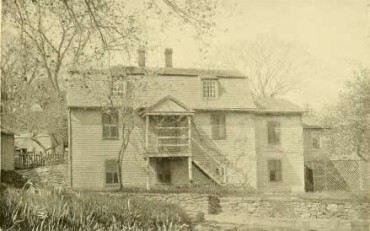 The house is in the Colonial and Georgian style, a center chimney 1-1/2 story gambrel.